When I was growing up, my favourite thing to play with my best friend was Barbie. M had the ultimate dream house. We loved dressing up our Barbies for different occasions - the beach, work (my Barbie often worked at McDonald's since I had that playset) and going out on a special dates with Ken. We could only consult each other about the variety of looks - all based on our combined (albeit very large) Barbie closets. If only Barbie - My Dreams was available to us back then, to let us know all the latest fashions in the world of Barbie and more. Thankfully it's now available to my daughter...and therefore me too! Barbie - My Dreams is an online interactive hub for contests, games and of course dreams! Canadian Barbie fans will love collecting their favourite things, catching up with Barbie and friends and entering the latest contests. Barbie - My Dreams is a safe environment that functions similar to the Pinterest, but for the biggest Canadian Barbie fans. Content is uploaded regularly and when you sign up for a Barbie my Dreams account you will be the first to know about new promotions - and of course, new Barbie fashion! Barbie is all about dreams and I could never, ever walk in heels like that - but love those shoes! As mentioned, the hub also has contests - and an awesome one is going on right now. Express your Style Contest: With the Express your Style contest, Mom and daughter can show off their style for their chance to win a trip for four to Toronto for an unforgettable shopping experience. The Express your Style contest is a way to show off your personal style, how you stylize your Barbie or showcase your style sense by uploading your favourite outfit. All the images are private and cannot be viewed by the public - so it's your personal spot to curate your style. Entering is super easy! Just post one of your fave fashion items to your Express Your Style DreamBoard. 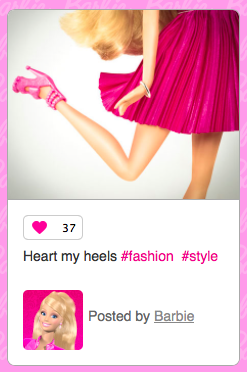 Then upload a photo of yourself, your friends and Barbie® showing your fave style or look! Whatever your style is, express yourself! Mix and Match for endless possibilities! Here's a link to the Barbie my Dreams contest page: http://www.barbiemydreams.com/contests. Hurry - the contest ends March 23! Does your child give Barbie a unique style?